Doctor Who: Looking back at WARRIOR'S GATE | Warped Factor - Words in the Key of Geek. Warrior's Gate marked the end of the E-Space trilogy - Full Circle & State Of Decay serving as the first two acts of Tom Baker's final season as the Fourth Doctor - and carried with it the sense of the end of an era. An era that would indeed end with Logopolis, though not before the building blocks of the next three years were in place! But let's just for a while postpone any consideration of the merits of celery as a jacket adornment or the finer points of cricket, and focus on a time when the long scarf was king. Jelly baby, anyone? The TARDIS is forced into a strange white void, a state of affairs in which the Doctor has some experience - if you recall The Mind Robber. But while the gateway into the Land of Fiction offered the Second Doctor, Jamie & Zoe the chance to see fictional characters as ' real' people in a place outside of conventional reality, the Fourth, Romana & Adric find themselves confronted by something quite different- what they find laid out before them is a portal to both the past & future! DOCTOR: Haven't you done enough damage already? 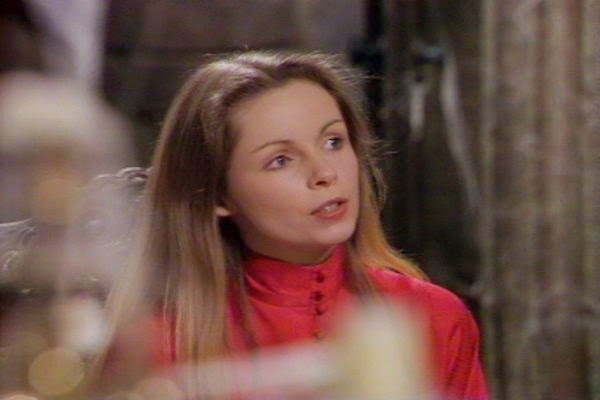 ROMANA: It's not me, it's a time rift. She won't respond to the co-ordinates. DOCTOR: Here, let me have a try. Just needs a little friendly persuasion, that's all. ROMANA: I have been friendly! DOCTOR: Probably too friendly. I said a little friendly. Firm but friendly. Watch. There- it's jammed. I've lost control. We're adrift in E-space. ROMANA: Come on, Doctor. We've got to do something. ZOE: Doctor, we're not actually in flight, are we? ZOE: Well, then presumably we've landed. So why isn't the scanner showing anything? DOCTOR: Well, because, well, we're nowhere. It's as simple as that. I'll be in the power room, Jamie. JAMIE: Aye, right. Hey! What does he mean, we're nowhere? ZOE: I don't know. I suppose he means that outside the TARDIS now is nothing. Just nothing. 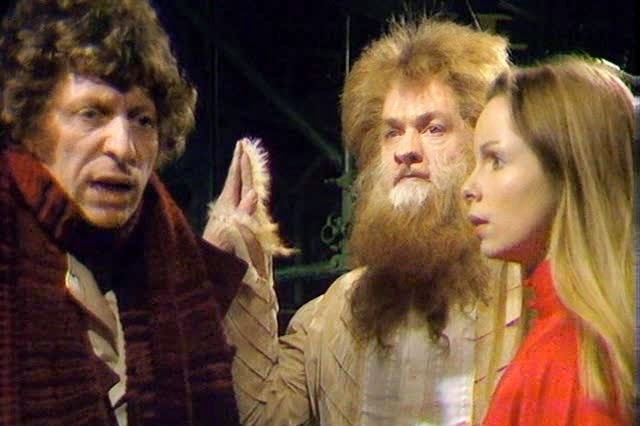 But as Romana explains to Adric, the gaping void into which he, she & the Doctor appear to have arrived is a bridge between positive ( N) & negative ( E) space. How's that for a science lesson? ROMANA: Don't you see? Our N-space is positive and your E-space is negative. ADRIC: I see. Then this must be the intersection. Well, somewhere near the intersection. They'll find out a whole lot more once they're forced to take a break from repairing K-9 by the arrival of some gun-wielding heavies! K9: All systems functioning. Recommend priority transferred to the three humanoid life forms approaching the TARDIS. 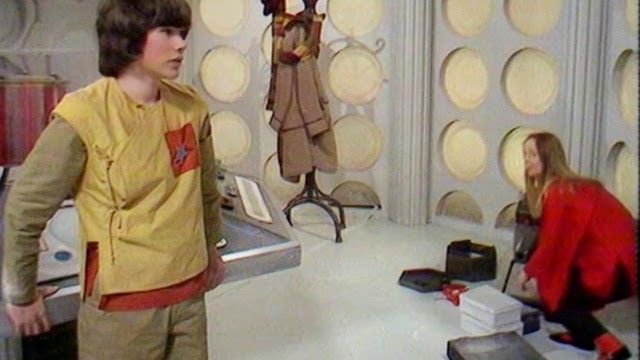 ADRIC: What? He's having delusions! Sadly, the ' tin dog' is quite right. Though it does at least prove he's regained his mental faculties, some small crumb of comfort surely. Adric is still rather worried by the fact '' They've got guns! Oh, I wish the Doctor were here...''. At the centre of the developing intrigue is Biroc, a time-sensitive Tharil enslaved to navigate a human crew of privateers through ' time winds' of the sort which have managed to heavily damage K-9. Only dwarf star alloy can contain the phenomenal abilities of the Tharil race- its referenced again in The Family Of Blood as the material with which the Tenth Doctor punished Father of Mine - '' He wrapped my father in unbreakable chains, forged in the heart of a dwarf star.''. The Eleventh is later kept in apparent confinement of his own, prisoner in a cell made of the very same stuff deep within Area 51 in Day Of The Moon, too. CANTON: We found Doctor Song. DOCTOR: These bricks, what are they made of? Where is she? CANTON: She ran. Off the fiftieth floor. DOCTOR: I'd say zero balance dwarf star alloy. The densest material in the universe. Nothing gets through that. You're building me the perfect prison. And it still won't be enough. But its actually Romana who tells us more about it in Warriors' Gate! ROMANA: It's dwarf star alloy. The whole hull's made of it. ROMANA: Dwarf star molecules are compacted under enormous gravitational force. That's why the alloy's so heavy. ADRIC: No wonder they need big motors. Before all that moon landing conspiracy theory-fuelling stuff though, a much younger & more favourably predisposed towards jelly babies Doctor must use a repaired K-9 to help himself & his companions free themselves from the void & get back to the universe he & they know! DOCTOR: Listen, K9, I'm sorry to have to ask you to do this, but all this stuff about the gateway is terribly important. DOCTOR: The whole thing's critically critical, old chap. This could be the way out. Now come on, be a good dog and power up. Come on, power up. Up, up, up, up. Good dog. Now. Now. What's all this about the gateway? But before he does he must face the loss of the woman he once jokingly dubbed 'Fred' during her first incarnation as she makes the decision to stay behind in E-space & help Biroc & the other Tharils, K-9 remaining by her side like any good faithful pooch for good measure. DOCTOR: We've made it. Quick, quick, inside. What's the matter? ROMANA: I'm not coming with you. DOCTOR: Inside. That's an order. ROMANA: No more orders, Doctor. Goodbye. DOCTOR: What? What a moment to choose. ROMANA: But it is, isn't it? A moment to choose. I've got to be my own Romana. BIROC: And we need a Time Lord. DOCTOR: No, no, no. Wait, wait. There's something else. K9. He'll be all right with you behind the mirrors. ROMANA: I'll take care of him. DOCTOR: I'll miss you. You were the noblest Romana of them all.